Learn about gas, soda, salt, and wood firing kilns! Fuels are organic and carbon based, they burn readily. Until recently, all kilns were fuel burning; even now when we have ready access to easily fired electric kilns, many ceramists continue to use fuel-burning kilns: this kind of firing has an enduring appeal. Very simply, there are certain kinds of visual effects that can only be obtained from a fuel-burning kiln. Fuels can be divided into solid, liquid, or gaseous.Until the late 19th century only solid fuels were available. Animal dung, wood, and coal are all solid fuels. In kilns fired with solid fuels the unburned ash residue must constantly be removed. Only one solid fuel – wood – finds a great deal of use among contemporary ceramists in the developed countries. Now most fuel-burning kilns are fueled with a liquid such as oil, or a gaseous fuel such as natural gas or propane. Fuel-burning kilns may be very simple structures; sawdust kilns fall in this category. More sophisticated fuel-burning kilns are designed around a concept of heat flow and they can be categorized in this way. As a result, we call the various designs updraft, crossdraft, and downdraft. In updraft kilns the firebox is at the base of the kiln: the flame moves up through the ware to an exhaust and a chimney at the top of the kiln. In kilns of the crossdraft design the flue is on the side of the kiln – the side opposite the burners – so the heat travels through the ware and is then drawn up the chimney. In downdraft kilns the flame begins at a firebox in front or on the sides of the firing chamber. It is directed up over the ware and then back down again through the ware. The flame is exhausted into an underfloor chamber and from there is drawn up the chimney. The crossdraft and downdraft designs are the most complex and efficient: it is much easier to reach the high temperatures required for stoneware and porcelain temperatures using kilns of the crossdraft and downdraft type. Most fuel-burning kilns are built by the ceramist rather than a commercial firm. To build them requires knowledge, time, and skill. Many kilns are the result of innovative and creative thinking and have a real impact on the life and work of the ceramist. Pat Oyama, “Thrown Porcelain Bowl,” wood fired at cone 14. In its luminous color, rich textures, and translucency we see the result of this very high-temperature wood fire. Photo by Bob Hsiang. Wood is a surprisingly versatile fuel; in many places in the world it is the most economical and widely available fuel. There it still may be used for low-fire work in simple updraft kilns. In the developed countries, however, wood is mostly used for high-fire work in complex downdraft kilns. Firing a wood kiln to high temperatures is physically demanding and requires constant attention: it calls for an instinctual understanding of what is going on inside the kiln. Almost all high-fire wood kilns work on the crossdraft or downdraft principal. These require a firebox in the front or bottom of the kiln with supports (made from either clay or metal) to hold the burning wood. There must be an outlet for spent gases; this outlet is usually placed near the bottom rear of the kiln. Finally, the outlet is connected to a chimney rising above the kiln which pulls the spent gases from the kiln and exhausts them into the atmosphere. Janet Mansfield, “Anagama Fired Jar,” height 45 cm. This piece was made from local clay and glazed with the ash naturally generated during the firing. The fuel was eucalyptus wood. The firing took three to four days in Mansfield’s anagama kiln. High-temperature wood firing is still used today by ceramists who value the richness of its wood ash, flashing, and reduction effects. During the firing the ashes of the wood fuel fall naturally upon the ware, and if the firing temperature is high enough the ashes are volatilized and become a glaze. These glazes have a soft dappled imagery which covers the top surfaces of the piece and falls gently away toward the foot of the piece. The richness of these surfaces is the main argument for using wood as a high-fire fuel. The high temperatures necessary to create these effects were first attained by the Han potters in China (200 B.C. to 200 A.D.). A special variant of the wood kiln is the hill-climbing kiln (known to the Chinese as the Dragon kiln and the Japanese as the Anagama kiln). In this very old design the ceramist relies on the height of the top part of the kiln to act as a natural chimney. This is a multiple chamber design; each chamber is connected to the next. The flame passes from one chamber to the next, moving up the hill until it exits at the last chamber at the top of the kiln. In this way a draft is created and the kiln can reach high-fire temperatures. Charles Hindes, “Wood-Fired Tea Bowl,” 1998. A classical interpretation of what the wood fire can do. Hindes has focused on this aspect of ceramics with great emotional and intellectual intensity. Liquid and gaseous fuels have become highly favored among contemporary ceramists. This is because they do not require constant stoking and they create no unburned ash residue that must be periodically removed. These fuels include oil, kerosene, natural gas, and propane. Modern kilns fired with these fuels are very flexible instruments and allow the ceramist to use a wide variety of glaze types and rich visual textures. Kathryn Holt, “Shifting Planes,” 18″ x 18″, tile form, earthenware, once fired with a light salt application in an oxidation atmosphere. For a number of years Holt has engaged in a group of very absorbing experiments with unusual materials and firing strategies. These explorations are neither purely scientific or purely aesthetic but rather combine both approaches to create a group of very special objects. Oil is widely available, inexpensive, and has many advantages. Those who fire with oil maintain that pieces fired in the oil kiln are apt to be a bit richer and a bit more highly reduced than those fired in the gas kiln. On the other hand, it is difficult to keep an oil flame lit until the temperature inside the kiln is above 1000°F. Oil-fired kilns must have a burner system which compensates for this characteristic. Oil kilns are also apt to be a bit smokier than gas kilns. Kilns fueled with natural gas or propane (a derivative of natural gas or petroleum) do not have combustion problems and so are used more in highly populated areas than oil kilns. The burners used to fire these fuels are quite efficient and have only a moderate impact on the environment. Natural gas, delivered in pipes, is popular in the United States and Canada. Its price is moderate but its availability is limited to populated areas. Propane, while more widely available, is more expensive. Because these fuels have very little residue and no ash they do not encourage as much visual texture as do wood or even oil kilns. Robert Winokur, “The Italian Hill Town,” 40″ x 9″ x 16″ (in two parts), 1996, salt glazed, Pennsylvania brick clay with slips and engobes. Winokur shows that salt fire can be very persuasively used to create architectural, highly thought out, imagery. Collection: Los Angeles County Museum. Photo by John Carlano. Many high-fire oil and gas kilns are downdraft designs. These kilns have a firebox at the front or the sides of the firing chamber (most often at the sides). These kilns are very similar in design to those meant for firing solid fuel with the exception that since there is no unburned ash residue, the firebox can be smaller and need not have a door for the removal of ash. A close-up view of a salt-fired surface. This photo clearly illustrates the light/dark patterns associated with the salt fire. There are gas kilns that are updraft in design and employ very powerful blower-driven burners. These rely on the efficiency of the fuel and the power of the burners to reach high temperatures. This design type is commonly found in commercially manufactured gas kilns. Salt firings require fuel-burning kilns that are specifically designed for the salt-firing process. They are constructed from refractory materials high in alumina (relatively unaffected by the salt that covers everything in the kiln). Special ports are built into the side of the kiln. At the point when the kiln is nearing the highest part of the fire (generally near cone 9 or 10), the ports in the kiln wall are opened and salt is forced into the kiln. The salt reacts very strongly to the heat of the fire and breaks into its component parts, sodium and chlorine. The chlorine is expelled as a gas (see sidebar on chlorine). The sodium is deposited on the surface of the ware with such force that the silica and alumina of the clay unite with the sodium from the salt to create a glaze on the surface of the piece. This surface is marked by a strong visual texture, called “orange peel,” a very active pattern resulting from the violent chemical reaction produced as the salt is exposed to the heat of the kiln. It is this surface which distinguishes salt firing from all other glaze treatments. Maren Kloppmann, “Box,” 41⁄2″ x 41⁄2″ x 41⁄2″, 1998, porcelain thrown and altered, finished with terra sigillata and glaze, then soda fired. These pieces are fine illustrations of what soda firing can do to enrich ceramic surfaces. Photo by Peter Lee. Colored slips may be applied to the body before firing; the salt will cover these without obscuring them but will enrich these surfaces to create a unique effect. Salt firings are particularly effective when used with pieces made with porcelain or porcelainous clay bodies. These bodies bond well with the salt and their white color is complemented by the salt glaze. 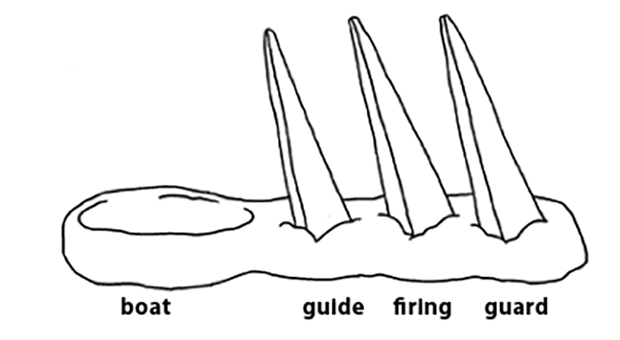 Salt firings typically are taken to cone 9/10. Salt is composed of sodium and chlorine. In the fire the two break apart and the chlorine becomes a gas. This gas is toxic (chlorine was used as a poison gas in World War I). Salt kilns should be located outdoors or in a well-ventilated kiln room. Peter Pinnell, “Jar,” height 9″, 2000, grey porcelain, wheel thrown and altered, coated with terra sigillata and fired to cone 8 in a reduction soda fire. This piece is a fine illustration of the character of soda-fired work. The color is rich and the surface is highly modulated and marked by some visual texture but not the strong overall light and dark pattern known as orange peel that we see in the salt firing. Soda firing (sodium carbonate) is similar to salt firing (sodium chloride), but it differs in that it is nontoxic (the chlorine in sodium chloride becomes a potentially toxic gas when the salt burns in the kiln). Soda firing also makes less residue inside the firing chamber. Most important, soda has its own unique and subtle character. The soda glaze surface is thin, nicely textured, durable, clear, and tightly bonded to the clays and slips it rests upon. As is the case with salt, it takes a good deal of heat to bring out the best of the soda. Therefore, most soda firings are to cone 9 or 10. At the height of the firing the ceramist introduces soda (sodium carbonate) into the kiln. The soda unites with the alumina and silica in the clay to form the clear surface finish. Many glazes react especially well to soda firing. The application of soda encourages these otherwise stable surfaces to become active and highly flowing and the colors to brighten. In some sections of the work the glazes pool and run off the edges of the form. They lighten these edges, highlighting those areas where the form changes direction. Lisa Ehrich, “Amputees,” 66″ x 48″ x 12″, 1999, thrown and hand-formed pieces assembled, stoneware clay body sprayed with white slip, iron oxide (in local areas), then soda fired. Soda firing is very effective when used with slips and glazes that have a mat surface.Where the soda affects them most they turn shiny, while elsewhere their surface stays dry or mat. Soda enriches the surface of unglazed areas of the piece and they take on a slight sheen. The contrast of these unglazed areas with those that are glazed is very appealing. Many ceramists who work with soda prefer spraying it rather than scattering it inside the kiln because in this way the soda diffuses over the ware most effectively (this is important because soda does not explode and scatter in the heat of the fire in the same way as salt). Soda firings are different from salt in that the salt firing results in an overall light and dark pattern (often called orange peel). Soda does not really do this. Instead, it causes the glazed surfaces to react to the soda by intensifying color and by encouraging highly flowing and pooling glazes. Though this was a 17th century technique, many contemporary ceramists have been active in reviving it. They were looking for a kind of firing that produced gases that seemed to be somewhat less dangerous than the chlorine gas that is a byproduct of salt firings. They wanted a look similar to salt fire, however. They ended up with a look that was in some ways similar and in others quite different from that of the salt fire. Want to learn more about raku firing? Check out this article! access, alumina, anagama, anagama kiln, application, ash, atmosphere, base, body, bowl, box, brick, calls, carbon, ceramic, ceramics, chamber, clay, clay bodies, clay body, clear, climbing kiln, collection, color, colored, colors, combustion, commercial, concept, cone 8, connected, contemporary, creative, design, designs, draft, dry, earthenware, edges, firebox, firing, firing process, firings, flashing, flow, flue, foot, form, gas kiln, gas kiln design, glaze, glaze on, glazes, group, heat, high fire, illustration, illustrations, imagery, iron, iron oxide, jar, kiln, kiln design, learn, local clay, low fire, maren kloppmann, materials, natural, oil kiln, oxidation, pattern, patterns, pieces, porcelain, potters, process, produced, pulls, raku, reaction, reduction, refractory, results, salt, salt fire, salt fired, salt firing salt firing, salt glaze, salt kiln, sigillata, silica, slip, soda firing, soda glaze, spraying, stoneware, stoneware clay, surface, surfaces, technique, terra sigillata, texture, tile, time, translucency, value, ware, wheel thrown, wood, wood ash, wood fire, wood fired, wood firing, wood kiln. We recently got a gas kiln used for soda a couple of times. Can we use it for a normal reduction firing? This is just the information I was looking for. Many thanks.